As I've aged, and hopefully matured, I've become more interested in philosophy. Its amazing how much philosophy there is in a good science fiction story. However it shouldn't have come as such a surprise to me as it did, considering both science fiction and philosophy deal with questions like how one can know anything at all, and how a person ought to live. Philosophy helps us see that ideas have consequences and as Ray Bradbury puts it , science fiction is the most important literature in the history of the world because it is the history of ideas. Paul Copan's book is small in size but large in importance. The audience is not just aspiring philosophers, but anyone in the church who is interested in, curious about or even suspicious of philosophy. Copan does a wonderful job of explaining what philosophy is, how it should be done and the value it has for Christians. This little book is a rare gem! Paul Copan is the ideal guide to what makes philosophy distinctively important and crucial for the life of any intelligent Christian. If you have any suspicions or concerns about the role of the mind on the path of faith, read this book! About Paul Copan - Paul Copan (PhD, Marquette University) is the Pledger Family Chair of Philosophy and Ethics at Palm Beach Atlantic University. His books include The Gospel in the Marketplace of Ideas, An Introduction to Biblical Ethics, Creation Out of Nothing, Did God Really Command Genocide? and Holy War in the Bible. He previously served with Ravi Zacharias International Ministries and taught at Trinity International University in Deerfield, Illinois. What's the point of studying philosophy when we have theology? Is philosophy anything more than a preparation for apologetics? Often called "theology's handmaid," philosophy has sometimes suffered from an inferiority complex in the church. Many Christians see little point in it at all. But as Paul Copan contends, it is possible to affirm theology's preeminence without diminishing the value and contribution of philosophy. 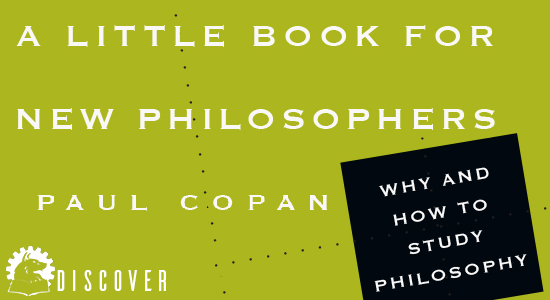 In A Little Book for New Philosophers, Copan offers a concise introduction to the study of philosophy. Aimed at newcomers, this brief overview is both a survey of philosophy's basic aims and categories and an apology for its proper function in the life of the Christian. By God's grace, Copan writes, philosophy can enhance our understanding and worship of God . . . and assist us in defending the coherence of our faith in the Lord Jesus Christ.